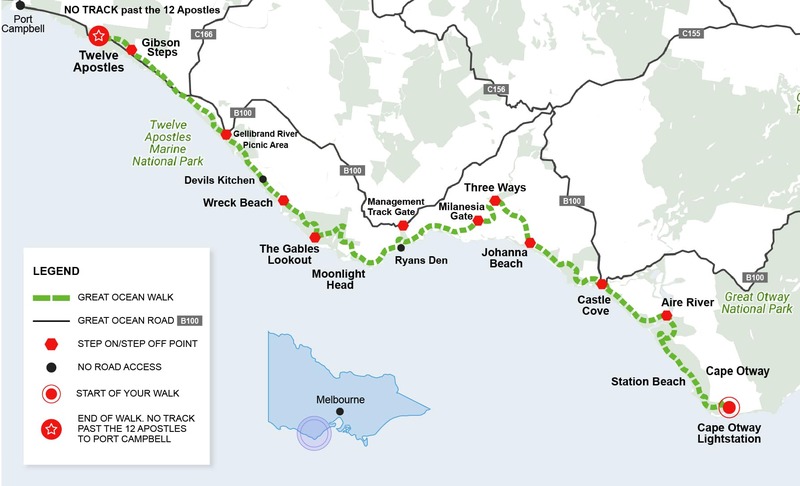 Walk 71kms of the ‘Wild Side’ of the track in four days, staying in wonderful accommodation locations along the way. A perfect choice if you don’t have time for the complete walk because you will still end your adventure at the spectacular 12 Apostles! Accommodation: 3 nights. Queen or twin share available with private bathroom. One room per 2 people. We will provide you a pack lunch when we drop you off at your starting point. Today you’ll visit to the Cape Otway Lighthouse. Walk up the 18 metre, 150 year old lightstation for views of the rugged coastline. Learn about the hard-working, isolated and incredibly resourceful lighthouse keepers. Visit the telegraph station built in 1859, the World War ll radar station and the Indigenous Cultural Centre. Passing the old cemetery you’ll see tombstones reflecting the hardships experienced by the early settlers here. The track meanders on towards wild and wonderful Station Beach, which is littered with driftwood. Take a small detour to Rainbow Falls, or carry on walking to enjoy sweeping views from the cliff tops. You’ll walk along the Aire Heritage River and over its bridge, towards Castle Cove. This magnificent beach has its own lookout station; a great way to end your days walk! Self-catered: We transfer you to a cabin in Cape Otway as there are no kitchen facilities. This guest house, a converted historical farmhouse, is in a wonderful location with great views from the stunning veranda. The homestead dates originally from the 1890s and overlooks the lakes of a river wildlife reserve and the Great Otway National Park. The owner who is a chef, enjoys cooking with her own vegetables, herbs and fruits picked from the garden each evening for dinner. Enjoy a candlelit dinner by the log fire in winter, and in summer, dining is on the veranda overlooking the reserve. Your last day will start with a walk through the Sheoak trees, dropping down onto historical Wreck Beach with its old anchors rising out of the sand. Hike on towards the Gellibrand estuary and as the track climbs up to the last section of the walk you will see the iconic 12 Apostles in the distance. At the end of your walk you can celebrate with a photo from the official 12 Apostles viewing platform. We will collect you at 4pm and transfer you back to Apollo Bay.